Are you ready for The Ultimate Culinary Getaway? Eight of America’s most talented and adored chefs will be cooking together for you in paradise at Four Seasons Resort Hualalai, for a once in a lifetime culinary travel experience – Chef Fest – Made in America 3 Four Seasons Hualalai. For five days and nights, February 26 – March 3, 2013, enjoy all the delights these illustrious chefs can cook up in this luxurious setting: unique dining events, gourmet dinners, Champagne tastings and pairings, a beach cookout, intimate cooking classes, a chefs’ tennis tournament, golfing with award winning chefs and lots more fun in the sun. 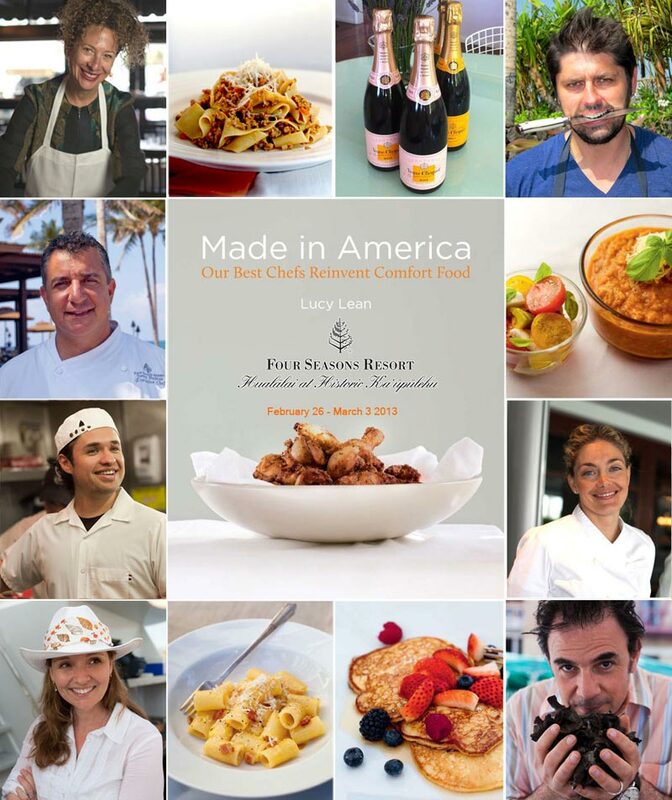 I am so excited to announce my collaboration with the Four Seasons Resort Hualalai as we bring you Chef Fest-Made in America 3, the third annual celebration of high-profile dinners, interactive cooking classes and culinary experiences. While celebrating the bounty of Hawaii Island’s local offerings, the series of events features some of today’s top chefs coming together to cook, teach and entertain in an intimate and relaxed beach setting. So who’s joining me in Hawaii this year for Made in America? Ludo Lefebvre – hot off the release of his new ABC primetime show The Taste I am looking forward to cooking up something special with Ludo. Given that he’s been hanging out with the new Brit in his life, Nigella Lawson, I can’t wait to continue the France versus England debate. Nancy Silverton – not only does Nancy own one of my favorite places to eat, Mozza Osteria, Pizzeria Mozza and Mozza 2 Go, she is also a demon with a tennis racket – just don’t ask her to serve. Matt Molina – as this years James Beard award winner for Best Chef of the Pacific what better backdrop than the waves rolling in to sand as Matt serves up Mozza at the Beach? Waylynn Lucas – yes I have the fonut queen joining the fun this year – as pastry chef at both of LA’s only 4 star restaurants before she opened her donut shop you know she will be cooking up delightful desserts for us – I’m thinking tropical, obviously with some rare Hawaiian white honey perhaps? Minty is most looking forward to a savory fonut on the beach! James Babain – the executive chef of Four Seasons Hualalai – I mean seriously is there any better job for a chef than this? His work with local farmers and the way he celebrates the bounty of the island is unsurpassed. 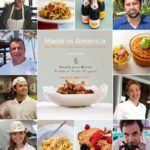 Joining the Made in America chefs this year are two chefs from other Four Seasons Properties – Alessandro Cartumini, the executive chef of Four Seasons Resort The Biltmore Santa Barbara and Tyler Shedden who is chef de cuisine for my chips and caviar mate Daniel Boulud at Café Boulud at Four Seasons Hotel Toronto. As well as phenomenal cooking classes there will be a Champagne tasting from Moet Hennessey and a class in the art of the cocktail from Patron. And it’s not just about food at Chef Fest – you can join Matt Molina in a round of golf on the Hualalai Golf Course, join the chefs on the beautiful waters off the coast of Hualalai for some stand-up paddle boarding and even battle it out on the tennis courts in a tennis tournament that’s sure to be fast and furious, game set and match! The five days will culminate with a once in a lifetime six course dinner based on recipes in Made in America at the Gala dinner on the Saturday night followed by a Champagne brunch the next morning – not too early I hope. Partners of Chef Fest 2013 include American Airlines, Big Island Visitors Bureau, Moet Hennessy and Patron Spirits. one signed Made in America book. Additionally, room nights and events are available on an a la carte basis. For more information and reservations, please call toll-free (888) 340-5662, contact your travel professional (chain code FS) or visit www.fourseasons.com/hualalai.